“You need a hug,” a friend said to me the other day. Even as I awkwardly let my friend pat my back, deep down, I knew he was right. I needed a hug. I needed to have a person’s arms around me while my body relaxed and gave up its weight. To be enveloped, to curl into the shape of another’s body is the most comforting feeling I know. It’s an excuse to let go and allow someone else to take care of me. It’s something that I haven’t done in a long while. It’s strange to be single after a lasting relationship. You realize you are finally alone and your life is no longer shared with another person. There is no longer a need to talk, to communicate, to say goodnight before sleeping. It’s even stranger after a lasting long-distance relationship. The invisible person far away you’ve always thought about disappears, this time for good. Before being alone didn’t really mean alone. Now, it does. When I sleep at night my bed feels empty. I delay closing my eyes to the point of exhaustion and nausea because I don’t want to go to sleep by myself. It feels like something’s missing, something utterly important. It should be there and I yearn for it but it never comes. So I see my desire for companionship leak into my friendships. The same cravings and little joys slowly transfer to my relationships with other people. And I don’t mind. It’s been a long time since I’ve been alone, and it feels good to just be with myself and only myself. Now if you’ve made it this far, I give you props for listening to me blather on. 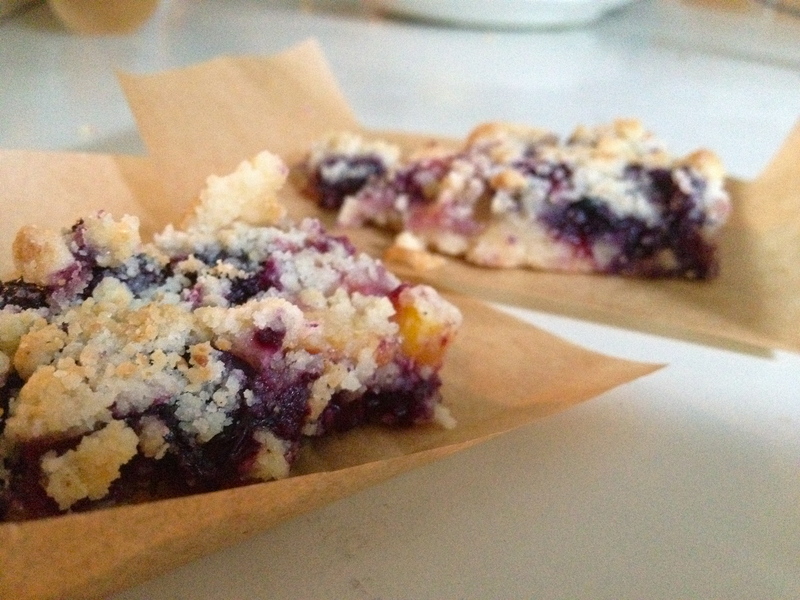 As thanks, I give you this recipe: blueberry and nectarine crumb bars. Buttery, fruity, crumbly, and chewy – this crumb bar is the epitome of easy homemade. These fruity treats make from the simplest of steps. You essentially mix things together and layer them. So yeah, it seriously can’t get any easier. Make them, it’s an hour of your time that you won’t regret. This dessert is really forgiving. You can variate with so many different fruits. Blueberries, peaches, nectarines, strawberries, raspberries – just use what you have at home. I actually did put some strawberries in mine and I loved that surprise pop of bright strawberry in each bite. 2) In a large bowl whisk together the flour, 1/2 cup sugar, baking powder, salt and lemon zest. 3) In a small bowl, whisk together the egg yolk and vanilla. 4) Take out your chilled butter and butter a baking dish, set aside. How big the dish is will determine how thick the crumb bars and their layers will be. Then cube the butter. 5) Add the egg mixture and cold butter cubes to the flour mixture and use a fork or pastry cutter (I used my fingers) to mash everything together until it resembles coarse crumbs. 6) Gently press 2/3 of the mixture evenly into the prepared dish. 7) In a separate bowl (big enough for the fruit), whisk together the remaining 1/4 cup granulated sugar and 2 tsp cornstarch. 8) Stir in lemon juice then add the fruit. 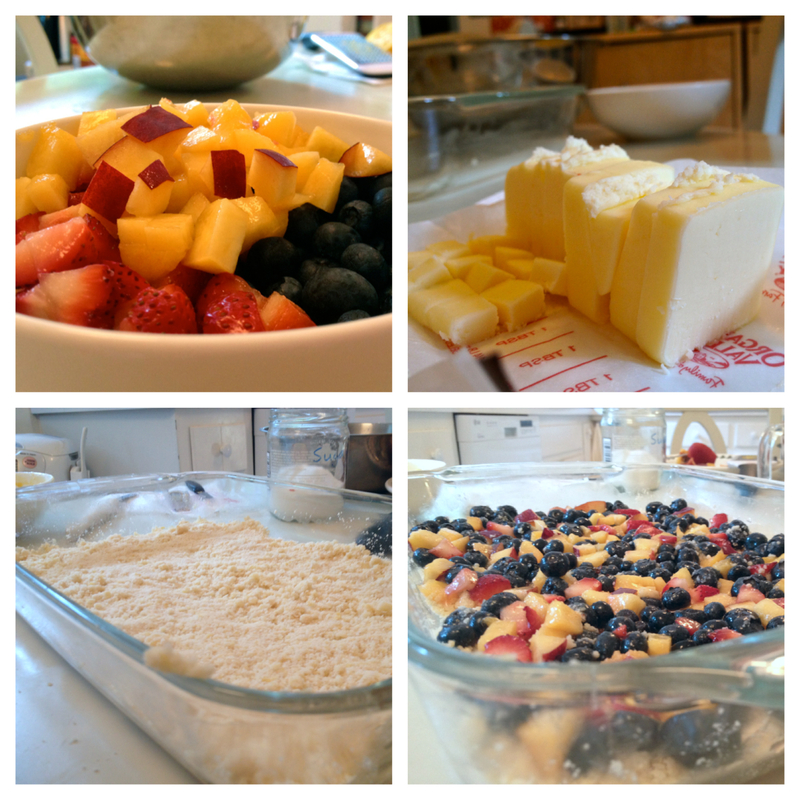 Toss the mixture for an even coat, then pour and spread the fruit evenly over the crust in the baking dish. 9) Sprinkle the rest of the crumb mixture over the fruit (I pressed some of the mixture together in my hands to make larger crumbs). 10) Bake in the oven for more or less 40 minutes until the top is golden brown and you see the fruit bubbling underneath. 11) Serve it hot with vanilla ice cream. Or allow to cool for about 20 – 30 minutes and cut into squares. * For leftovers I like to microwave them before munching away. 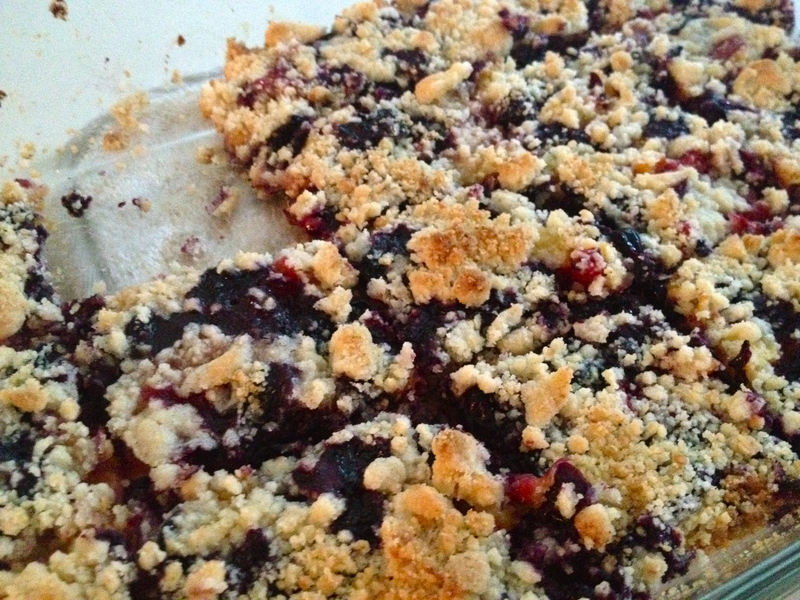 I find the crumb bars are best when the fruit is bubbling and warm, almost like a fresh, chunky jam. Chocolate is supposed to be a woman’s undoing. At least, it’s mine. No matter what the occasion, celebration or diet, I always manage to make room for chocolate. Less than an acquired taste, chocolate has been a flavor that has taken me 19 years to love. You see, I was always a vanilla kind of girl. I still am. But lately I’ve been craving some chocolate something real fierce. As a result, a single 12 oz. 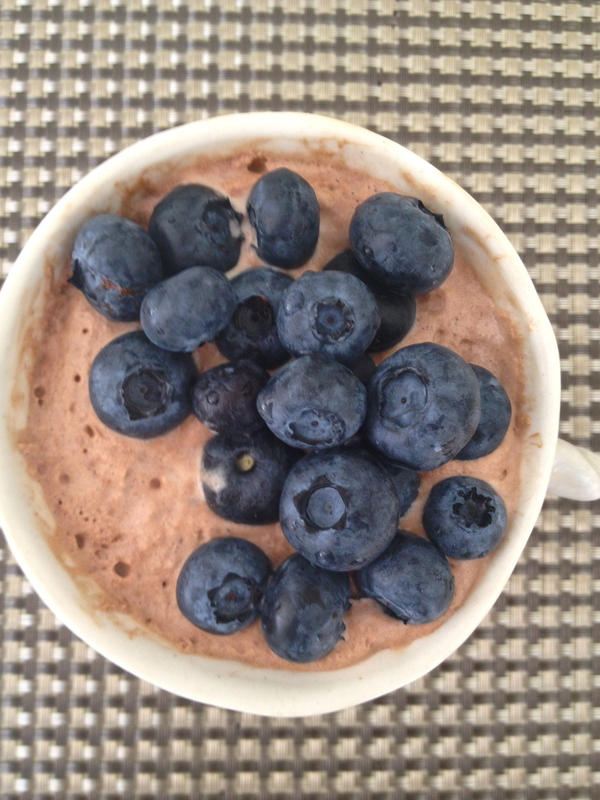 pouch of chocolate chips thoughtlessly plucked from the supermarket shelves turned into a week filled with chocolate souffle, chocolate microwave cake and…this luscious chocolate mousse. 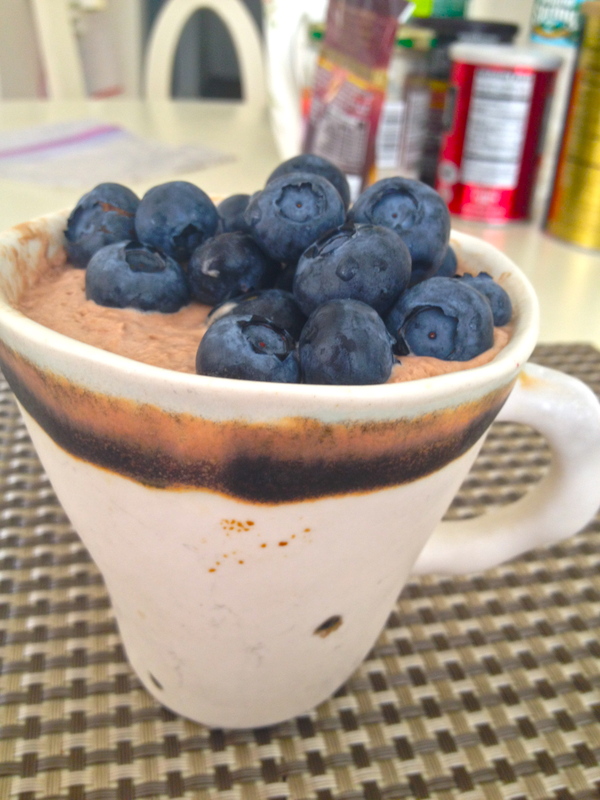 Oh man, this mousse was good. Creamy, airy, light. Everything you’d ever ask for in a mousse. Topped off with some fresh fruit and this dessert was sublime. With a rich chocolate flavor but still refreshingly cold – it’s perfect for the summer. Make this the night before for a wonderful mid-afternoon snack or enjoy it as the perfect summer night dessert to accompany warm, balmy air and a slowly setting sun. Trust me, you’ll see what I mean. 1) Whisk the heavy cream until it forms stiff peaks and keep refrigerated until needed. 2) In a separate bowl, whisk the egg yolk and sugar for 2-3 minutes, until it becomes pale in color and thick. Set it aside. 3) In a small saucepan, melt and combine the chocolate, expresso, butter and water over very low heat, constantly stirring until the chocolate just melts. If you want to do this the proper way, simmer an inch of water in the saucepan and melt these ingredients in a small bowl placed over the saucepan (like a double-boiler). 4) Spoon ¼ of the chocolate mixture into the egg yolks and combine. (This will temper your eggs a.k.a. prevent them from scrambling) Pour the egg yolk mixture back into the saucepan with the remaining chocolate and add the vanilla extract, stirring constantly. Cook over low heat for a couple minutes or until the mixture thickens. Keep stirring while letting it cool for a few minutes off the heat. 5) In a small bowl, whisk the egg white until it forms stiff peaks. Fold the egg white gently into the cooled chocolate mixture. 6) Then, fold the chocolate-egg white mixture into the whipped cream. Don’t over mix! 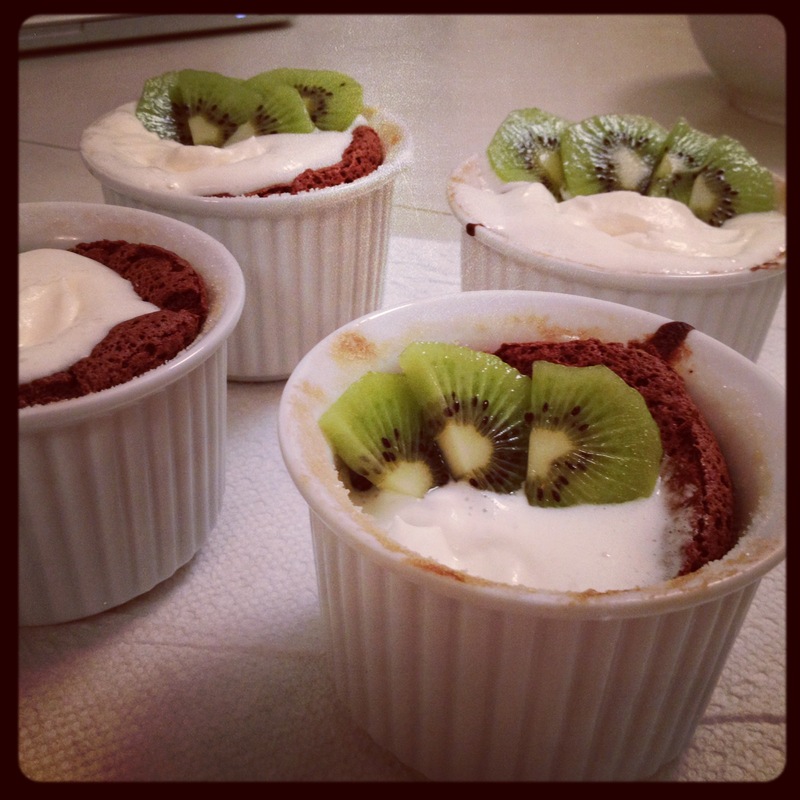 The whipped cream will lose its fluffy texture and trust me, you want your mousse to be fluffy. 7) Pour the mixture into (preferably cute) cups and refrigerate for a minimum of 4 to 6 hours. These past few weeks I’ve been trying to recreate the fun, carefree days I enjoyed last summer. Going to the beach with friends, staying up until 4 a.m. to shamelessly sleep in ’til 2 the next day; you know, the usual. But it hasn’t worked. Half of my close friends have gone off to Korea, the remaining few are working full-time. And me, I’ve been tutoring a bit, interning a bit. Nothing too exciting (or time-consuming). Seeing as I’m constantly fighting boredom, you would think that I would be chugging away at this blog. This is the summer to start my blog, I tell myself. This is the day I start writing posts, the day I go to the grocery store to pick up ingredients, the day I actually cook a meal, I tell myself. But that too hasn’t worked. Apparently, the allure of online shopping and Facebook are far too tempting for me to finally open this website and start writing. Well, today is the day. I’ve managed to write this much, so why not shoot for more? These past couple of days, I’ve been thinking about what I would write about and in what kind of voice. But the fact is, I don’t know. So, here comes my attempt to define this blog and its framework…or at least, what I believe it will be. 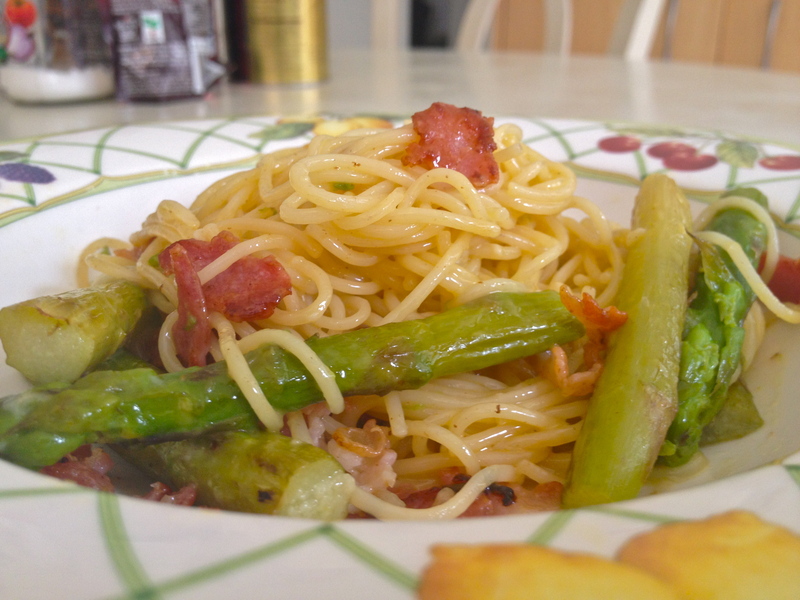 Originally, I had planned to create a food blog. Seeing as I’ve named this baby “The Sunny Side-Up Kitchen,” it IS a food blog. But I promise, it will also be so much more. This blog will have recipes, photos of meals and desserts, but it will also be a journal, a place to keep my writings and thoughts. Maybe I’ll even give snippets of fashion inspiration and other girly things, who knows. 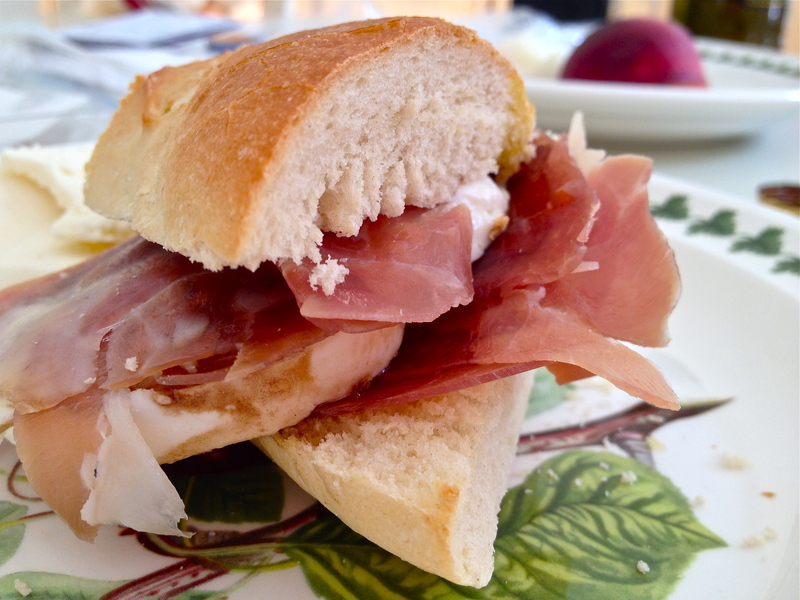 All in all, this blog is an experiment. An experiment of thought, of expanding my writing, and of photography. All of my photos will be taken with my iPhone as I don’t have a fancy DSLR, so please excuse the quality. All of the writing will be amateur writing and probably, not very good. Again, I’ll try my best. But in the end, what I really want to say is, thank you for having the patience to watch me grow. Thank you for following The Sunny Side-Up Kitchen.